Specialty CME Credits: Included as part of the 4 credits, this CME activity is eligible for 4 Trauma CME and 0.5 Pharmacology CME credits, subject to your state and institutional approval. Several reminders and evidence updates were given here. Indications for antibiotics were reviewed, and having evidence against its use in many dental emergencies helps make decisions. 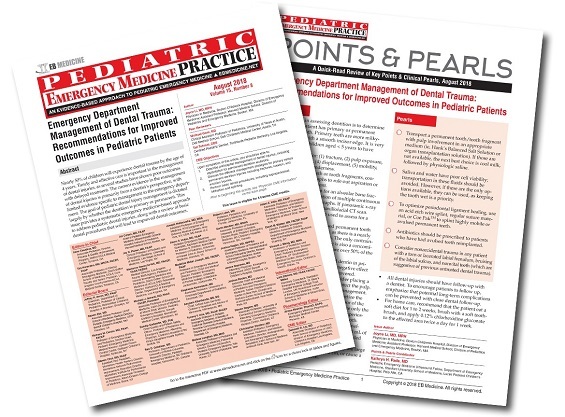 Approaches to the oral trauma patient were reviewed adequately in my opinion and the article helps to review the ways to determine the age of teeth, especially in situations where the parents aren't available. Excellent diagrams. Great insight to emergent dental episodes in ER and the management. We see these so often, and often refer to dentists instead, when we could do some interventions first to help save the tooth. I was weak on dental emergencies. Great review! I feel more comfortable with the basic management of teeth that will need splinting, calcium hydroxide past, and other management such as films. I will be able to give a more detailed & accurate physical exam for both primary & permanent teeth. I will be more confident in using supraperiosteal nerve blocks. Great overview, much more comfortable dealing with these injuries. Now I’m ready for splints! Great article with excellent images, and thanks for the information on Coe Pak. I will give the Coe Pak a try. And Calcium Hydroxide patches. Little experience with these, but your article bolsters my confidence levels. Also, I have been shy about urgent f/u within 24 hours and will encourage dentists on call to see pt next morning even if it's a weekend. I now have better methods to stabilize a tooth. I will feel much more comfortable with the lingo involved in dental trauma in pediatric patients and will be able to much more effectively communicate to patients and dentists. I now have a much better understanding of the classification of dental injuries and am better able to determine primary vs permanent tooth. Excellent diagrams. Also, several reminders and evidence updates were given here. Indications for antibiotics were reviewed, and having evidence against its use in many dental emergencies helps make decisions. 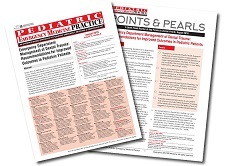 Approaches to the oral trauma patient were reviewed adequately in my opinion and the article helps to review the ways to determine the age of teeth, especially in situations where the parents aren't available. This was a very helpful issue. Dental injuries often come in after hours and no dentist is available. I feel much better about managing these childre after reading this. Thanks! I will have more confidence in dx dental injuries.